BlueStacks Download Latest Version from 7Downloads. Download APK files and run on your PC. Due to the slow pace of online mobile games like Clash Royale and Clash of Clans for PC and mobile platforms, many people prefer playing on two different accounts simultaneously so that they have something to do while their town hall is taking ten days to upgrade from level 7 to level 8. Even with fluid interfaces of modern games, it is quite frustrating to change accounts to play on the other account. And if you have a phone with slow hardware and a small screen, you’d prefer not playing these games at all. What if you could play these games on a 16-inch screen and with super powerful hardware? BlueStacks for PC makes that dream a reality. BlueStacks is an Android emulator. It enables users to run Android games and apps on computers running Windows or Mac OS. In this page you will find every bit of information which you may ever need about BlueStacks, however, for making things smooth, we have shared the BlueStacks download link below. At least 2 GB of RAM/main memory. You can set up BlueStacks as a whole new device and install apps like WhatsApp APK (messaging), Subways Surfers APK (game) and SHAREit APK or Xender APK (file-sharing). 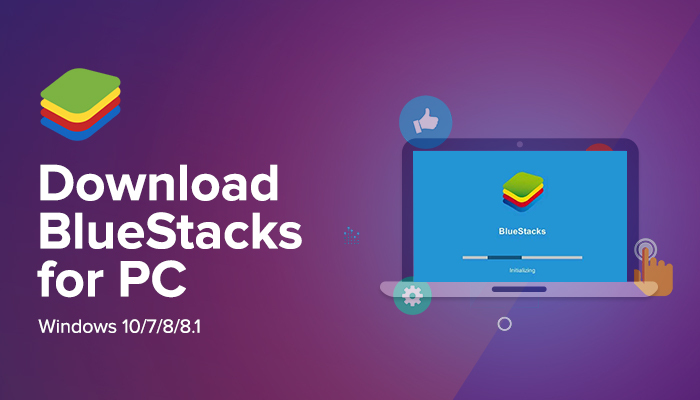 Step 1: Click the BlueStacks Download button above to get the application. This is a large file so make sure you have a good internet connection. Step 2: After downloading, go to the Downloads folder on your computer. Find BlueStacks and install the application, you just need to wait for minutes to complete. Step 3: When you start BlueStacks for PC for the first time, it will take you about five minutes to start the engine. It will then ask you to log into your Google account to access Google services such as Google Play Store. Step 4: After logging in, you can download apps from the Play Store. You can also install apps by double-clicking on their APK files. We have already shared many APK’s on our website, search for any app you want to install you will find it here. Once you installed BlueStacks on your PC, you will notice that it is like a Web browser (UC Web Browser). So, it’s easy to familiarize with the interface. It allows you to multitask like as if you are changing tabs on the web browser. BlueStacks works pretty fast, however, it may also depend on your computer’s hardware. When you open BlueStacks, you can see drawer that contains the applications. The drawer on the left side contains the installed apps like Browser, Camera, Google Play, Media Manager, and of course the Settings. The drawer at the bottom is for the App Center, Play Store, BlueStacks World, Instance Manager, and the Help Center. You can install downloaded APK on the BlueStacks and also allows you to delete apps. The icons on the upper right part of the interface are for minimizing and maximizing the window, your Account, Notification Center, and BlueStacks Points and Speedup. Applications that run on your Android device can be installed on your computer with BlueStacks. You just need to enter the app you want to get on the Search bar and it will display related searches. Or, you can click the Google Play and find the app you want to install, just like what you do when you are searching on your Android phone. BlueStacks can take screenshots while you are using it. If you are playing games or watching videos, and you wanted to take a screenshot, just click scissor icon on the bottom right corner of the application. There is no way you won’t love BlueStacks especially if you are a gamer. Play on a widescreen, no lag because the hardware of your device is good. You can install everything that is into your Android phone. BlueStacks deserves praise for being much smoother than other Android emulators that are available for free. If you have any queries regarding the steps or any other query about BlueStacks, then please let us know in the comments section below. Ok, that was some technical issue (One of our team members! )… Anyhow download it now.